Joe: I like the black & white. It reminds me of The Honeymooners. Aldolfo: Or Renoir, early Godard. Independent film is a wonderful breeding ground for fresh, new creative talent, but there are "tendencies" involved. It is said that most student films either begin with alarm clocks or end in suicide. Also, many indie projects tend to feature extremely quirky, over-the-top characters, excessive voiceover, and are about filmmaking, as if the filmmakers know little else to make a movie about. Don't get me wrong, each of these attributes can be used very well to create a superb film, but In the Soup manages to get bogged down by nearly all of the above. Aldolfo Rollo (Steve Buscemi) is a filmmaker, raised on Fyodor Dostoyevsky and Frederick Nietzsche. He has a 500-page epic screenplay polished and ready to go. Entitled "Unconditional Surrender," he is sure it is destined to be his great debut, on the innovative level of his idol, Tarkovsky. For the time being, his life is less than glamorous. He lives in a shockingly narrow and rundown building, where he is constantly dodging his gangster landlords and hoping to attract the attention of his one true love and neighbor, Angelica (Jennifer Beals). He is convinced this stunning woman is destined to play an angel in his opus. Aldolfo has the heart; all he needs is the money and a little self security. In steps Joe (Seymour Cassel), an overbearing, charismatic, almost jolly old man with delusions of grandeur. After seeing Aldolfo's ad in the paper regarding his screenplay, he calls up the youngster and makes a proposition to fund his project. Aldolfo is happy to cater to any interest, though he can tell he is getting in over his head. Before long, the aspiring director is thrust headlong into a chain of petty crime, led by the enthusiasm of Joe, who breaks, enters, and steals with a smile. At times, Joe's personality comes in handy, but Aldolfo was born serious. He cannot take this disorder much longer, even if each crime brings his closer to funding his movie. Eventually, Angelica is trapped in the soup, and the obligatory catharsis is reached. Alexandre Rockwell's film has an intriguing premise and the occasionally solid scene, but ultimately fails to engage. It is little more than a collection of bits that really have little relationship or momentum. I almost felt as if many of these scenes could have been shuffled around with little effect on the end product. Characters come and go, comedy tends to fall flat, and Aldolfo never makes his movie! Despite some plot issues, the film's style is well-executed. With visuals in stark black & white, it has an effectively dirty, noir feeling that serves the tone. Performances are impressive as well, though character arcs are less than fluid. Steve Buscemi locks into his usual, quirky, uncomfortable self. Jennifer Beals is intimidating at first, then becomes a warm, very human individual. Seymour Cassel is nearly frightening as his unpredictable character, and pulls of his eccentricities with great panache. Steven Randazzo and Francesco Messina provide some comedic moments as Aldolfo's singing, criminal landlords. However, without a script that has more than a few enlightening moments, these elements seem wasted. Image Transfer Review: Fantoma has created a luminous black & white transfer for this release. Detail is high, and the stark, high-contrast photography is well-rendered. Edge enhancement is extremely minimal. Fine grain is evident throughout, but is not distracting. Well done. Audio Transfer Review: A Dolby 5.1 track is kind of wasted on this type of film. Dialogue is front and center, showing some production limitation issues, but is clearly audible. Surrounds provide only the occasional ambient fill or musical support, but are relatively quiet throughout. Extras Review: Fantoma has packed this release with quite a few extras. First, we have three commentaries to go through. Track One is the group track, featuring Steve Buscemi, Stanley Tucci, Elizabeth Bracco, Carol Kane, Jim Jarmusch, Steven Randazzo, and director Alex Rockwell. Track Two features Seymour Cassel, while Track Three contains comments from the director alone. Most of these comments are comedic and anecdotal, while Rockwell's contains info on the nuts and bolts the filmmaking process. Interestingly enough, this film was originally released on video in color, without the director's involvement. Shot on low contrast color film and printed on high contrast black & white stock, this was meant to be seen as it is presented here. Next are a couple of video pieces, beginning with a new interview with the beautiful Jennifer Beals (9m:57s). She offers comments and anecdotes on various aspects of the project, including cast members, financing, and her character. Also included is a collection of home video clips, shot by Steve Buscemi on-set (13m:28s). These are some relatively entertaining, candid moments. 6 deleted scenes and 8 outtakes can be found as well. Deleted scenes include The Art Gallery, Skippy Visits Aldolfo, You Got Eggs?, Skippy's Girlfriend, Aldolfo's Mother and The Psychic (12m:14s total). Outtakes include $100 to Watch TV, EZ Rent-A-Car, The Loft, Christmas Carols, The Eye, They Wore Big Shoes, Joe's Dance and Skippy (in color) (9m:17s total). Each section has a "Play All" option. Finally, there is a step-by-step guide to dancing the Cha-Cha-Cha enclosed within the fold-out insert. The disc contains a button that takes you to the instructional scene contained within the film. For a fan of this film, this is a treasure trove of extras. 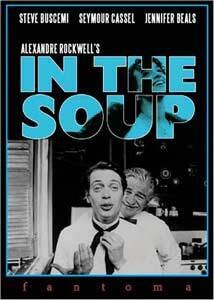 In The Soup contains some standout performances, but the material has little direction, failing to fully engage the viewer. It tends to fall into some of the dreaded indie pitfalls, but has a bright spot here and there. Fantoma's effort is first rate.